As part of the curriculum, our LLM students can participate in two moot courts, the prestigious Jean-Pictet Competition on international humanitarian law (IHL) and the Nuremberg Moot Court Competition, as well as in public pleadings on specific conflict situations. The Jean-Pictet Competition is recognized as the leading IHL competition and one of the most innovative training programmes for students in public international law. This week-long event tests students on their knowledge of and ability to implement IHL, as well as other branches of international law, through role-playing exercises based on a hypothetical armed conflict scenario. The dynamic structure of the Competition encourages participants to consider IHL issues from various perspectives, while allowing the jury to evaluate each team's theoretical knowledge, practical understanding and presentation style. Three students can participate in this leading moot court following a competitive selection process carried out by a Geneva Academy jury. For selected students, participation replaces two optional courses and can be validated for 6 ECTS. In 2016 the Geneva Academy team won this prominent IHL moot for the first time. In 2017, the Geneva Academy team reached the semi-finals of the competition. The Nuremberg Moot Court is organized by the International Nuremberg Principles Academy. It is held in Courtroom 600 of the Nuremberg Palace of Justice, where the famous post-World War II trials took place. 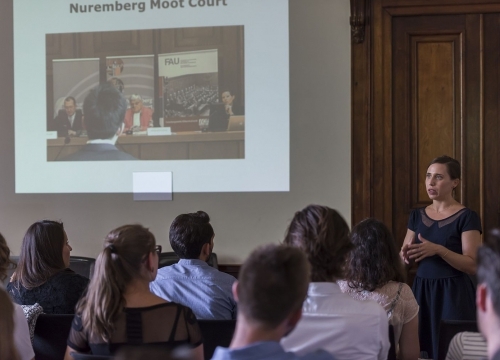 The Nuremberg Moot Court competition preserves this legacy of the fight against impunity, promoting and implementing the knowledge of international criminal law and the Nuremberg Principles, which are the foundation of criminal courts worldwide. The Moot Court takes place every summer. Teams from around the world gather together to present their legal briefs before a panel of judges, comprised of world-renowned experts. Each team presents either as the prosecution or the defence. Teams are evaluated for the content of their briefs as well as their presentation skills, teamwork and spirit. LLM students can participate in this leading moot court following a competitive selection process carried out by a Geneva Academy jury. For selected students, participation replaces two optional courses and can be validated for 6 ECTS. For its first participation in 2017, the Geneva Academy team – made of students from our LLM and from our Master in Transitional Justice, Human Rights and the Rule of Law – won the Prize for the Best Defence Memorandum. The Nelson Mandela World Human Rights Moot Court Competition is organized by the Centre for Human Rights at the University of Pretoria, in partnership with the Office of the United Nations High Commissioner for Human Rights (OHCHR). The pre-final and final rounds take place every July at the Palais des Nations in Geneva. The best 10 teams from each UN region argue two-sides of a hypothetical case on issues of international human rights law before a ‘bench’ of human rights experts and judges from international courts and tribunals.  Two LLM students can participate following a competitive selection process carried out by a Geneva Academy jury. For selected students, participation replaces two optional courses and can be validated for 6 ECTS. As part of the IHL course, LLM students participate in two public pleadings on specific conflict situations like the Gaza conflict in summer 2014 or the 2008 South Ossetian conflict. Teams are assigned specific roles and plead, in front of a jury, on concrete issues related to the conflict. These include: classification of conflict and applicable law; classification of territory and persons; killing and destruction of property; use of weapons and precautionary measures during ground and air offensives; targeting of persons; detention of prisoners by armed forces and armed groups. LLM students have been participating in the Jean-Pictet competition since the beginning of the programme as it gives them exposure to concrete cases and allows them to put into practice what they are learning in class.